Be a part of history by leaving a lasting impression on the campus of Caravel Academy through the donation of a personalized engraved brick. Each brick purchased will be prominently displayed along the walk in the Alumni Courtyard which connects the 400 and 600 wings on campus. Proceeds from the brick campaign will support the George E. Glynn Alumni Tuition Scholarship presented each year to a deserving student from grades 8 – 11. PLACE YOUR ORDERS TODAY ! How to Order: Go to www.bricksrus.com/order/caravel or use an order form. Each 4 x 8 brick can include up to 3 lines of text and up to 21 characters per line. Each 8 x 8 brick can include up to 6 lines of text and up to 21 characters per line. Symbols are available for an additional $10.00. Payment: All checks should be made payable to Caravel Academy Alumni Association, 2801 Del Laws Road, Bear, DE 19701. Payment Forms: Unfortunately, we are unable to process credit card orders. We accept cash and personal checks. Please forward your payment to the school even if you place an order online. 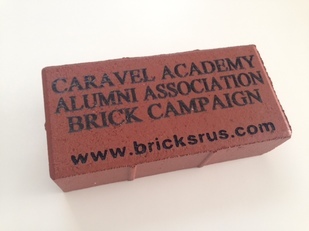 Brick sales end on May 31, 2019 Direct questions to skeever@caravel.org.